With OroCommerce, you can determine the way a particular website is operated by customizing it according to your business requirements. OroCommerce redirects anonymous users to the default website. Logged in customers users may also be redirected in case their current website is not identified. Navigate to System > Websites using the main menu. Click on the website you would like to use as default (e.g. Australia). On the website details page, click Set Default. Now the website is marked as default and will be used for the anonymous access. OroCommerce storefront has a number of menus that may be rearranged and customized. You can enable or disable menu items for a particular customer, website, or a mobile device by setting related conditions. Click the website you would like to edit a menu for (e.g. Australia). 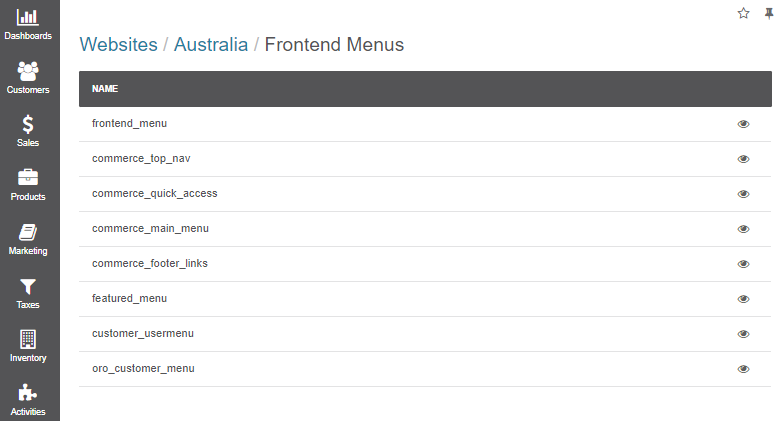 On the website details page, click Edit Frontend Menu. Drag-and-drop menu items to rearrange them. Create new items and dividers if necessary by clicking Create Menu Item or Create Divider (in the button group on the top right of the page). Click on the menu item to edit its details. Find more information on how to edit and customize the storefront menu in the Menu Management section. Once you are happy with the menu contents, click Save. OroCommerce enables you to create a web catalog with different product collections and customize it for a certain website in a way you prefer to make shopping easy and efficient. You can also organize a specific content tree by building additional content nodes and customizing menu items per each website individually. With OroCommerce you can create and set up flexible product prices for different websites, link the price lists to a particular website, a customer, or a customer group, and schedule price changes. You can also create and manage multiple warehouses, track your inventory status and the availability of your products, as well as their quantities, in each warehouse assigned to a particular website. The Warehouses and Inventory section covers the details on how to configure inventory-related settings globally and per a website. Additionally to configuration set for product categories and price lists, you can determine which customers, customer groups, or websites are to view specific products by customizing a related product visibility per each product individually. Follow the Manage Product Visibility section for the details on how to set certain visibility restrictions for selected products. Similarly to a visibility restriction procedure set to a product, promotion visibility can also be limited to a particular website, a customer. or a customer group. Follow the Promotions section for the details on how to create and manage promotions. OroCommerce provides sellers with effective payment solutions that help enhance customers’ buying experience. Integration with the most popular payment services as PayPal, Authorize.Net, Wirecard, InfinitePay, and Apruve into OroCommerce enables various payment transactions to be made in a particular localization and on a certain website. Learn more about how to assign a payment method to the required website in the Payment Rules Configuration section. Also refer to the payment configuration for the detailed instruction on how to set a merchant location and configure integration with third-party payment providers. Similarly to configuring payment methods in OroCommerce, you can create an integration with a shipping provider, such as UPS, FedEx, and Flat Rate and customize its settings per a particular website by adding a shipping rule. Also, refer to the shipping configuration on the system level to set the default shipping address, enable or disable shipping units of length and weight, and specify the tax code to be applied to the shipping cost. When you prepare web catalogs for you storefront, you can create and enable a custom web catalog for the website or set up a custom node content for the website in the default web catalog.